At seven months old, Noah Al Hadidi lost his eyesight to retinitis pigmentosa, a rare inherited degenerative eye disease. From then on, Noah’s story would be one of perseverance and determination. Throughout his childhood, Noah’s family sought to help him regain his eyesight using the techniques and resources available to them in his native country, Oman. At 4 years old, his parents burned him on the back of his neck and head in hopes of improving his vision. Although the treatment was ineffective, the scars remain, as do the memories of his visits as a young boy to hospitals across India and Dubai – none of which were able to help him. During the early 1990’s Oman did not have the resources available to support blind students. And so, at 7 years old, Noah accepted a scholarship from Oman’s Ministry of Education and left his family to study at Saudi Bahraini Institute for the Blind in Bahrain. He spent ten years in Bahrain and traveled to Saudi Arabia in 2005 to complete his higher education three years later. According to Noah, a common belief in the Middle East is that vision is required to understand science and math. Noah wanted to prove them wrong. After graduating high school in 2008, he decided to continue his education and pursue a degree in Computer Science. After months of writing letters to Oman’s Ministry of Higher Education, the organization finally granted him a scholarship to study in the United States. In 2009, Noah sold his mobile phone to pay for his visa to the United States. In his own words, “Being blind, my mobile phone is the main way I am able to communicate with friends and family, and so, this was a really difficult decision.” Noah flew on his own to Colorado, and, determined to improve his basic English, enrolled at Colorado State University (CSU) in 2010, beginning his studies with the Intensive English program. Throughout college, Noah worked with different departments at the university to improve courses and websites for people with disabilities. He graduated in 2015 from CSU with his Bachelor’s degree in Computer Science and in 2017 with his Master’s degree in Computer Information Systems. Noah challenged a number of cultural barriers in the years following his arrival to the U.S.: He got a guide dog named Amiga, defying the common perception that dogs are unfit as pets. He became the first blind person from Oman to study science. Noah’s success even inspired Oman to send more students with disabilities to the U.S. to study science. 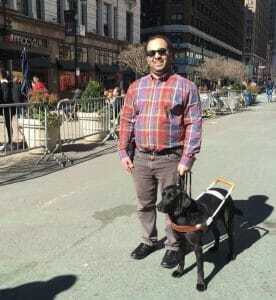 Noah was hired as Charter’s first Accessibility Architect in 2018. Within his first year at the company, he obtained five professional certificates in accessibility. Noah’s goal is to help Charter become the most accessible company in the U.S. for both customers and employees.